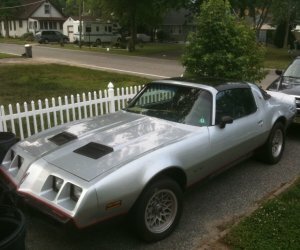 FOR SALE 1980 FireBird Formula RARE T-Top WS6 120,000 miles Runs great Body solid and in beautiful condition. NADA INFORMATION __________________Low____Average_____ High Base Price-----------------5,200............$7,700...........$10,450 OPTIONS ADD VALUED 301 V8 Engine..................10%..............10%..............10% Air Conditioning.............10%..............10%..............10% Sunroof..............................5%................5%................5% TOTAL PRICE...............$6,500...........$9,625..........$13,063 Ok Is set up for air but needs compressor ( might have it , online aprox $300) Needs new Interior Carpet (aprox $220) Needs new Battery (aprox 100) Crack on dashboard (aprox $200 to redo) Out of all the models built that year this had the fewest produced (Trams-am- Firebird- Esprit- Formula ) Vehicle is ABOVE average condition but am willing to take $1025 off average retail so am asking $8600 Needs a little work but well worth it ! After 6 years of attending car shows have never seen another one ! First acceptable offer takes it... Serious Only Please.... Further questions contact me by email or phone 732-558-1610 ask for Jack Reason for selling is that I Just purchased a new challenger and will be bringing that to shows so I am looking to sell the firebird so it gets some use. I am asking a very reasonable and fair price, this car has brought me a lot of fun weekends but do not have the room to keep it so would like someonelse to get as much enjoyment as I did, and would like to do some mods to my new vehicle.